Ever wonder what happened to Charlotte Collins after she married the delightful Mr Collins? 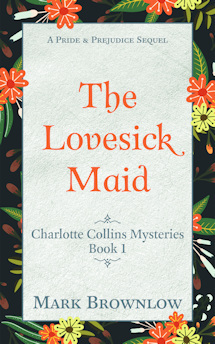 Well, wonder no more…Charlotte is the heroine of The Lovesick Maid, a short novella just published for Kindle and Kindle Unlimited only. We know she’s intelligent and practical, and those are exactly the characteristics Charlotte needs to solve a cozy little village mystery. One of the Rosings maids is sick, but all is not as it seems (it never is). The book features familiar characters from Pride & Prejudice, like Lady Catherine and (unfortunately) Charlotte’s husband, but also a host of new characters and locations that bring Hunsford and Rosings to life – above and below stairs. There’s a pinch of romance in there, too. It’s not long – just 88 pages or so on your Kindle. The book is meant as a quick afternoon’s diversion, curled up in an armchair with a spot of tea and a biscuit or two (or three). I’m working on the next in the series, when Mr and Mrs Darcy come to visit, and…well, you’ll have to wait and see. I love the way you’re picking characters that we knew little about from the actual novel. Dare I say it!!!! Yes I will, I’m sick of Darcy and Elizabeth. I’m trying to win your book on different sites of the tour because I’d love to read about Mr Bennett. I’ve always had a soft spot for him. I’m off now to purchase The Lovesick Maid. That made me think – I do find myself intrigued by the characters we know less of. Especially by the questions that arise from their stories. In this case, what happened to Charlotte after she married such a man, with such a patron? 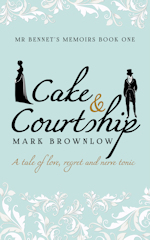 In Cake and Courtship, why is Mr Bennet like he is? Anyway, lovely to hear from you and thanks for following the tour – good luck with the giveaways!